Hello everybody! As you might notice in the sidebar, Dollsondablog has a new sponsor! The new sponsor is My Dolls Life! They provided a swimsuit for me to review and something else for the giveaway! The swimsuit that they sent me was very nice! It's very floral and really fits Kanani. As for how well it fits Kanani, it fits really nicely. It fits even better Kanani's swimsuit! There are Velcro straps on the shoulder instead of the back, where Velcro is usually is. I think it makes it easier to put it on my doll. But, because Velcro's Velcro, you have to make sure to put your doll's hair in an up-do like a bun when you put it on. All in all, I think this outfit deserves 5 stars! Hey! This is a quick post to... spill the beans a bit. Human got a package from one of the new sponsors! She told us that there is going to be a summer giveaway soon(possibly this month)! Do you want to know who the sponsor is? Well, you have to check the sidebar for more info! I can't tell you what our sponsor sent, though. But, check out the blog everyday to see if the giveaway went up! Oh, and one more piece of information I have: Human told us that we going to use Rafflecopter for the giveaway again. Shh! Human and my sisters will flip if they find out about this secret information! Oh, and should I become a spy? It would be so fun to find out other secret information! Let me know in the comments below! Hey guys! I hope that you guys are having a great summer! This is kind of like a writing prompt, but do you bring your dolls on vacations with you? 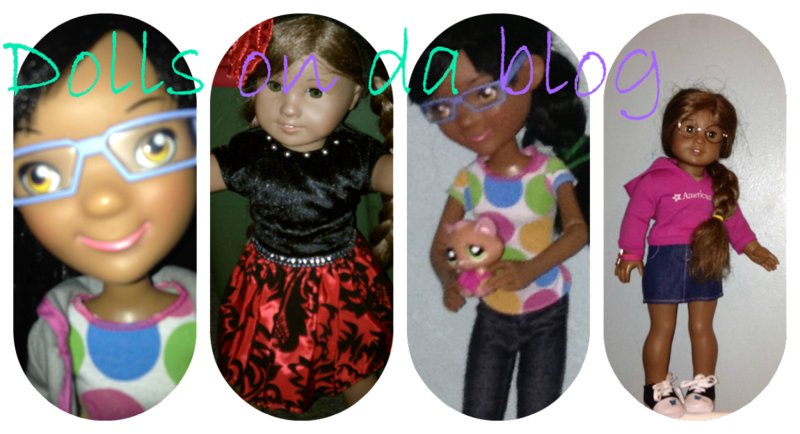 Oh, and if you have and pictures of your dolls on vacation, send them to dollsondablog@gmail.com. Have fun! Hey guys! Human will be going to make a Stopmotion with IMovie soon! We decided(it was actually me) that YOU should choose the theme! You can name anything you wish into the comments. Then Human will put up a poll with everybody's suggestions! Start Brainstorming! !